ICA Bulletin November 1965, January 1968, May 1994 and April 1997, courtesy of the Institute of Contemporary Arts, London. The Institute of Contemporary Arts (ICA) bulletin has always been instrumental in communicating a multi-disciplinary programme that encompasses music, film, talks, poetry, visual arts and performance to its audience. Founded in 1946, the Institute of Contemporary Arts (ICA), London is a membership organisation that seeks to promote an understanding of radical arts and culture. The ICA bulletin has always been instrumental in communicating a multi-disciplinary programme that encompasses music, film, talks, poetry, visual arts and performance to its audience. The earliest 1950s bulletins function as a simple notice to inform its readership of the ICA’s activities. The uniform visual identity of these early bulletins is partly shaped by the ICA’s conception of itself as an ‘institute’, an organisation whose ethos was equally beholden to the ideas of the laboratory, the university and the professional society, as it was to the modern art gallery or museum. In the 1960s the bulletin adopted a magazine format, where the listings were supplemented by articles exploring contemporary poetry, music and visual art, alongside critical writings, reviews and polemic. In bringing together these different disciplines, the bulletin evoked in print the interdisciplinary aims of the ICA, and the diverse programming that took place within the gallery space itself. Casting off its 1950s consistency, the bulletin adopts what CHK Design Director, Christian Küsters described as a ‘non-identity’ that characterised the ICA’s representation of self: simultaneously indebted to the self-publishing endeavours of artists, the poetry chapbook and the zine. Subsequent decades saw the collage-indebted style of the 1960s give way to a muted colour palette and a rationalised identity. These changes culminated in the creation of a new logotype in the 1980s and the subsequent adoption of a new typeface and branding by acclaimed designer Tony Arefin (1962-2000) in the 1990s. 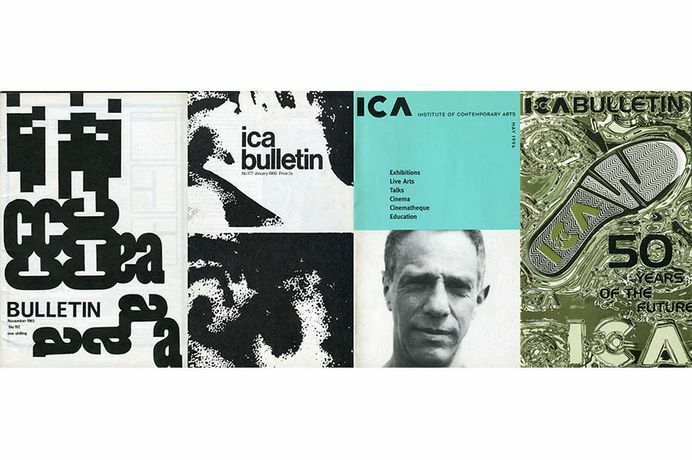 Following a series of re-designs the ICA bulletin has more recently become an online platform. Bringing together event listings with articles and projects conceived by ICA staff, collaborators, students and artists it has retained the characteristic sense of mutability that has typified the bulletin since its inception. Join us on Thursday 11 January from 5 pm to 7 pm for the special Preview, before the show opens to the public on Friday 12 January. For all enquiries about Bonington Gallery exhibitions and events please email us, or call +44 (0)115 848 8268. Alternatively, please visit the Bonington Gallery website.